We all know how much fun boating is, and how it’s great to share it with the entire family. The weather is great, and the season is officially here! Boaters can play hard, and when they hit the waters just about anything can happen. 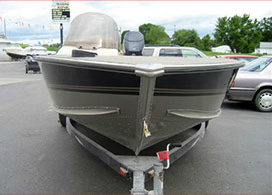 Severe damage to boats often requires structural repairs. Structural damage compromises the integrity of the hull and your safety. Boating structural damage usually occurs from abrupt groundings, collision with other objects, or the rotting of a wooden hull. Significant damage to the hull may cause the boat to flood with water or produce stress cracks which may develop into hull failure at a later time. 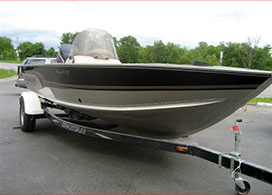 After any significant collision or hard grounding, the boat should be hauled out of the water and the hull inspected for cracks, fractures of joints, or any other damage. Serious abrasions affect the integrity of your boats’ structure, not to mention the ugly damage they cause the vessel. Abrasions break down the barrier of gel-coat or paint and expose the hull’s fiberglass to damage. The conditions a boat faces from water and sunlight can quickly break down unprotected fiberglass. Also, abrasions sometimes go all the way through the fiberglass and damage the core of the boat’s hull. 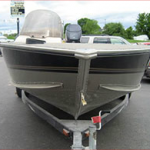 Shown here: Alumacraft Magnum 175: This boat hit a pole, buckling the entire starboard front deck and splash rail. The splash rail was replaced, the side and bottom were straightened and painted. The paint job now is better than factory. Anchor Marine Repair can repair minor and major gel coat damage including chips, spider cracks or “crazing”, osmotic blistering also known as “boat pox”, scratches, de-laminations, gauges & color fading often called “chalking” etc. If your fiberglass or aluminum boat has any type of impact or structural damage, fractures, soft or rotted floors, transoms and/or stringers, we can help. 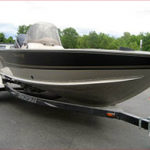 We will keep your boat looking good season after season! We had a collision with an unknown object in the water causing a huge crack in Hull body of the boat. Would this be fixable ? ?